Every year, 1 in every 88 children in America are diagnosed with autism. Although autism has reached epidemic proportions, it is far from understood. In this revised edition of 41 Things to Know About Autism entitled What is Autism? 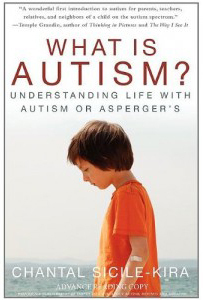 : Understanding Life with Autism or Asperger’s, Chantal Sicile-Kira provides a clear, instructive explanation of autism. If you know someone with autism and would benefit from a quick, straightforward explanation of the condition, this book is for you. What are the causes of autism? Can vaccines cause autism? How can I recognize the symptoms of autism? What are the emotional effects of autism on the family? Why do children and teens with autism act the way they do? After her son was diagnosed with autism, Chantal Sicile-Kira set out to learn what she could about the disorder, found in 1 in 100 children. Her research and experience led to 41 Things to Know About Autism, in which she shares insights and information about living with what’s often described as an invisible disability since it has no universal physical characteristics and can’t be seen on the face. In question-and answer form, Sicile-Kira’s book discusses common worries, tackles controversial treatments, celebrates successes and ends on a hopeful note for the future. Her son, for whom doctors had predicted institutionalization, heads off to college this year. A wonderful first introduction to autism for parents, teachers, relatives, and neighbors of a child on the autism spectrum. Chantal Sicile-Kira has compiled 41 commonly heard questions and provided practical and useful responses. This book can serve as an incredible resource for family members, professionals and individuals on the spectrum attempting to better inform the public about various aspects of ASD. The book is comprehensive and incredibly readable. Chantal’s strength is in knowing the needs of the autism community and responding in a thoughtful manner. Few in the community offer the practical advice across the expanse of autism with the same insight and wisdom Chantal does. In her crisp and authentic voice, Chantal provides a work that broadens the understanding and offers many answers to the most perplexing problems. Well done! Chantal’s work cuts right to the heart of the matter. She Approaches the subject by acknowledging it’s immensity and it’s baffling characteristics. Yet by sticking to a doctrine of clarity and pragmatism, she also enlightens.